York University is one of the UK’s top scientific research institutions. In the Summer of 2013, the Chemistry Department opened an all-new atmospheric chemistry research facility, which is the first of its kind in the country. The Wolfson Atmospheric Chemistry Facility houses everyone from research and faculty staff, to under- and postgraduate students, and is intended to be a world-leading centre for research into air quality and climate change. Husht were brought in to conduct acoustic treatment when the building was extended in 2017/2018. The Atmospheric Chemistry building contained a variety of laboratories and office spaces, which are naturally home to a wide range of lab equipment. 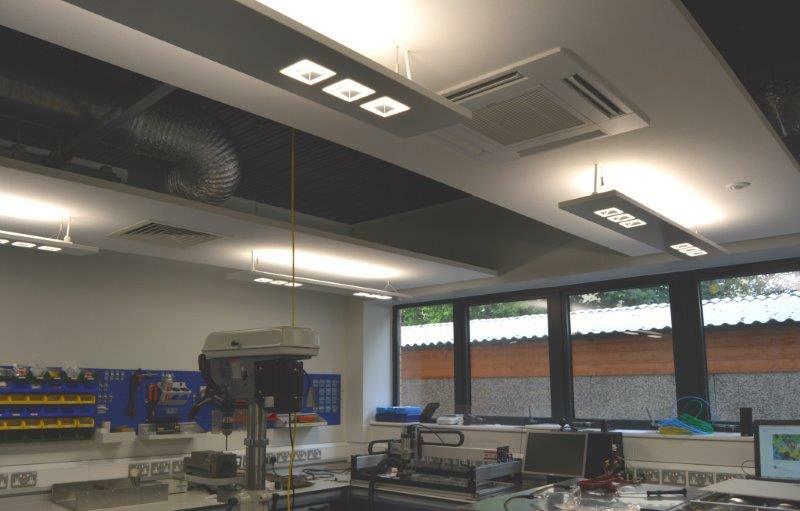 In many cases this equipment can be particularly noisy, which could pose an issue in spaces where study or research is being undertaken. As this was a fully planned new build, consideration for this was made in advance to ensure that this modern build was fully fit-for-purpose. Due to the nature of the building, many services were installed in the ceiling space of the laboratories. This meant that direct fix panels would not be an option. Instead, large acoustic rafts were suspended from the ceiling, also forming a platform into which lighting and other services could be installed. 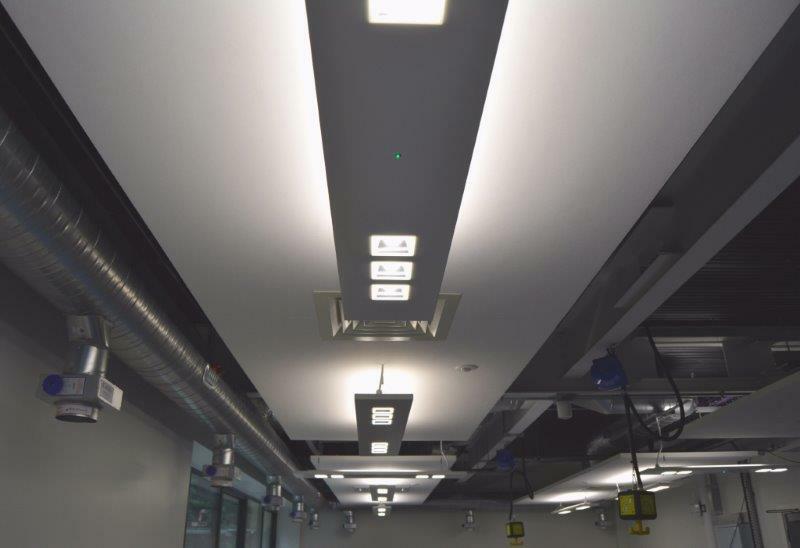 These rafts have excellent acoustic properties, and also serve to cover some of the ceiling services for a neater finish. The result is that all of the laboratories in the facility have excellent acoustics. 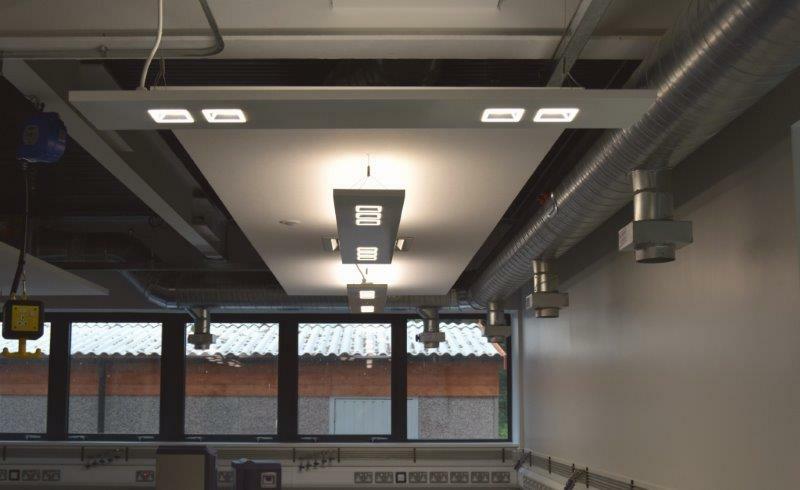 Staff using the machinery can do so without excessive reverberation from the ceilings, and researchers and students can hear one another while discussing their work. The suspended rafts have also given the rooms a clean, modern and functional finish.